People who park their cars like douche-bags are among the most annoying people in the world. The sad part is, unless you are an enforcer of the law, you can't do anything about it. You can punch the owner of the car in the jaw or break the car's window but these will give you more trouble than what you already have. Well, there's one way to instill some etiquette into these douche-parkers without having to break their jaws or their cars. 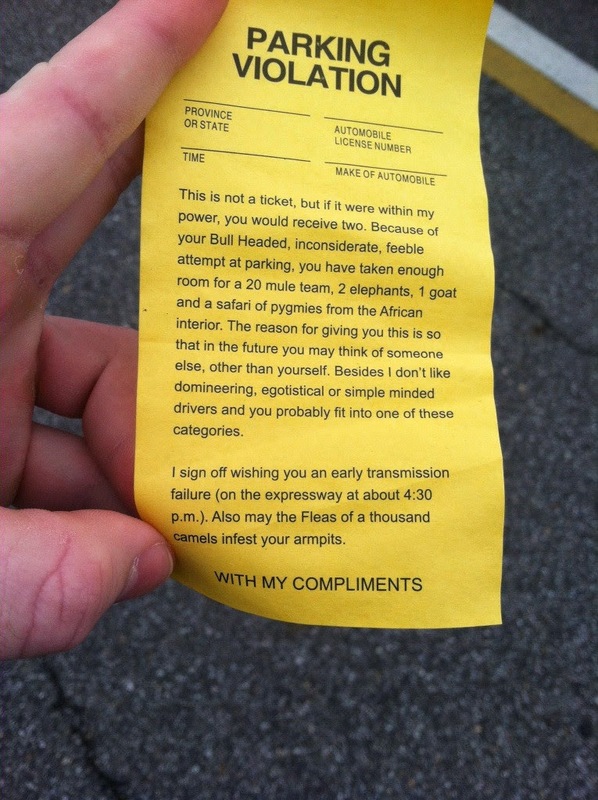 Gag parking tickets. Like the one below. "This is not a ticket, but if it were within my power, you would receive two. Because of your Bull Headed, inconsiderate, feeble attempt at parking, you have taken enough room for a 20 mule team, 2 elephants, 1 goat and a safari of pygmies from the African interior. The reason for giving you this is so that in the future you may think of someone else, other than yourself. Besides I don't like domineering, egotistical or simple minded drivers and you probably fit into one of these categories. I sign off wishing you an early transmission failure (on the expressway at about 4:30 p.m.). Also may the Fleas of a thousand camels infest your armpits.